Dimensions 1.25 by 5 by 7.75 in. 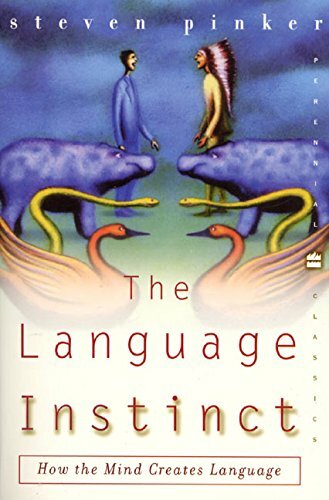 The classic book on the development of human language by the worldâs leading expert on language and the mind. In this classic, the world's expert on language and mind lucidly explains everything you always wanted to know about language: how it works, how children learn it, how it changes, how the brain computes it, and how it evolved. With deft use of examples of humor and wordplay, Steven Pinker weaves our vast knowledge of language into a compelling story: language is a human instinct, wired into our brains by evolution.Â The Language InstinctÂ received the William James Book Prize from the American Psychological Association and the Public Interest Award from the Linguistics Society of America. This edition includes an update on advances in the science of language sinceÂ The Language InstinctÂ was first published. About: In this classic, the world's expert on language and mind lucidly explains everything you always wanted to know about language: how it works, how children learn it, how it changes, how the brain computes it, and how it evolved. About: The codirector of the MIT Center for Cognitive Science explains how language works, how it differs from thought, why adults have difficulty learning foreign languages, and why computers cannot learn human language. About: Looks at one of the most fundamental of our species' distinguishing characteristics: the use of language. About: In this classic, the world’s expert on language and mind lucidly explains everything you always wanted to know about language: how it works, how children learn it, how it changes, how the brain computes it, and how it evolved.